On your marks, get set, go! 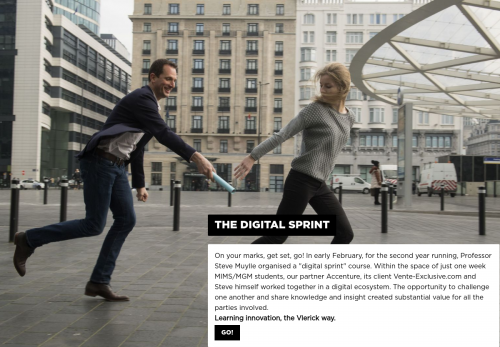 In early February, for the second year running, Professor Steve Muylle organised a "digital sprint" course. Within the space of just one week MIMS/MGM students, our partner Accenture, its client Vente-Exclusive.com and Steve himself worked together in a digital ecosystem. The opportunity to challenge one another and share knowledge and insight created substantial value for all the parties involved. Learning innovation, the Vlerick way.